Good Afternoon Everyone! I just got back in from lunch with my “Seester” Tawnya to chat about her wedding photography ideas that I have for her and I had a fantastic email waiting for me. If you saw my update yesterday on Twitter or Facebook, then you may have seen that I was interviewed by a good friend of mine & colleague in the “biz” – Sara France. 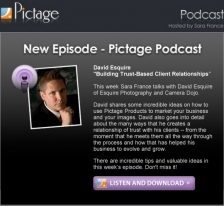 She is the host of a very popular podcast for Pictage & they wanted to have me on for this week’s show. On the podcast I was able to chat about the community on Camera Dojo that we’re creating along with sharing the importance of having a trust-based relationship with your clients. In today’s day & age, trust & relationships seem to be hopping in the back seat with customer service and I really wanted to help others know that those are three very key cornerstones to what we do. If you’d like to listen to the podcast or subscribe to it, just click the button below & you’ll be able to check it out on iTunes. I hope you’re having as great of a West Coast Wednesday as I am – cheers!